In the instructions, this seemed like a big deal. However, it's quite simple and quick if done correctly. (note: If it's NOT done correctly, it's a real hassle to do). So here's what I would recommend. First, drill a diagonal hole in a regular 1/4-20x3/4" hex bolt, then thread the cable through it. The photo shows the pieces involved in this step. The modified hex bolt will screw into the bottom of the handle assembly. For the lower bracket, a cable stop is needed. A cable adjuster could be used. However, I found a washer can be used instead. You will need to take apart the cable and shorten the cable to 4ft. The outer outer covering should be shortened to 3ft. I found using a dremil with a cutting wheel and a vise enabled me to produce nice clean cuts. INSTALL HANDLE TO THE FRAME. To install, thread the bare cable through the large nut, modified bolt, lower bracket on the frame & lower washer. I found that the large nut is too large to turn easily within the confines of the frame. So, instead, I tried another idea. Don't turn the nut - turn the handle! Start the small hex bolt and tighten both at once! If your small hex bolt turns are off by a few, the brake cable still can spin around. Then jam the large hex nut with a screwdriver and turn the handle into place. To make turning the handle easier, I found enlarging the notch on the battery tray was helpful. Then, put the cable cover back on & run the covered brake cable over the motor to the back wheel area. Thread through the brake notch on the wheel & secure the cable to the pinch bolt. Zip tie to the shock hump if the cable flops around too much. The cable will stretch a bit so you'll need to re-tighten the cable more than once. Handle bar assembly (consisting of handle bar, handle clamp, hand grips, lighting controls, thumb throttle, speedometer and two handbrake handles). Cowl clamps & hardware as seen in supplemental photo. Pliers & 10MM socket for pinch bolt. Shopvac and broom to clean up little fiberglass bits. Trying to install the handle the wrong way - about an hour. 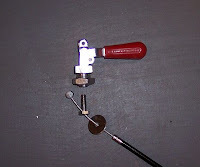 Using drill press to drill hole in hexbolt for emergency brake cable holding bolt - 15 minutes. Making brake cable and cable housing shorter by using Dremil tool - 15 minutes. Twisting on handle, running cable to rear wheel & securing the cable with a pinch bolt - 15 minutes.